Chip's Challenge - The Chip's Challenge Wiki - The Chip's Challenge Database that anyone can edit! Chip's Challenge is a game by Chuck Sommerville that was originally released for the Atari Lynx in 1989. It was later ported to other platforms, the most well known being the Windows port. The Windows version was originally released in the Microsoft Entertainment Pack in 1992, and later in the Best of Microsoft Entertainment Pack. It has remained a popular game ever since. 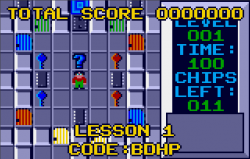 This game features Chip, who wants to become a member of Melinda's select Bit Busters club, and is tested with a puzzle which he must finish in order to enter. 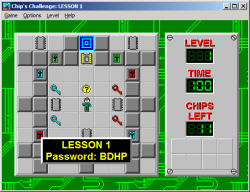 The original Chip's Challenge level set has 148 levels (and 149 in the Windows version) - but many others were created with level editors that were soon created after Chip's Challenge was released. Eventually, the community began releasing Chip's Challenge Level Packs constructed from selected levels from these custom sets, each containing 149 levels. Chip is willing to do anything for Melinda the Mental Marvel, more than anything, because he wants to join Melinda's exclusive computer club, the Bit Busters. Finally Melinda has offered him membership, but on one condition! Chip must find his way from one end of Melinda's magical clubhouse to the other, picking up cosmic computer chips along the way. If that sounds easy, then you've never been to Melinda's magical clubhouse. It's awesome inside, but tricky, and a little scary too. There are teleports, invisible walls, force floors, water traps, locked doors, and plenty of monsters. There's magic, mystery, and behind the scenes there is Melinda, keeping score on your progress and providing helpful hints. As you succeed in helping Chip move through each level of the clubhouse, Melinda gives you a secret password that allows you to return. And Melinda rewards perseverance. If she thinks Chip has tried long enough and hard enough on a level, she'll let him sneak through to the next level. But it takes a lot of perseverance to impress her. How big is the clubhouse? 144 levels is the rumor. But some claim that Melinda is still building. In any case, it defies dimensions so don't get lost. This page was last edited on 14 March 2019, at 00:48.